(by Michael Goodwin, NY Post) — The word “disconnect” is the appropriate way to describe the chasm between America’s government and its citizens. We all have our favorite examples, but none can match the events of last week. His “victory” is a disconnect that will live in infamy. The deal is essentially a nonaggression pact with Iran, a form of appeasement that renders unfair any further comparisons to Neville Chamberlain. At least Hitler promised peace at the 1938 Munich conference after the British leader engineered a German annexation of parts of Czechoslovakia. Iran’s supreme leader doesn’t bother to pretend he wants peace. On the contrary, he vows that the nuclear agreement will have zero impact on the policies of the world’s largest state sponsor of terrorism. Think of that: We are lifting punitive sanctions not in the aftermath of victory or as part of a comprehensive peace agreement. We, along with other so-called great powers, are unilaterally declaring peace while our adversary repeats its declaration of war against us and Israel. Even Iranian “moderates” openly tell their allies that the $100 billion they will get from the deal will help them carry out Khamenei’s terrorist agenda. They say these things without fear the truth will scare off President Obama or turn Democrats against him. 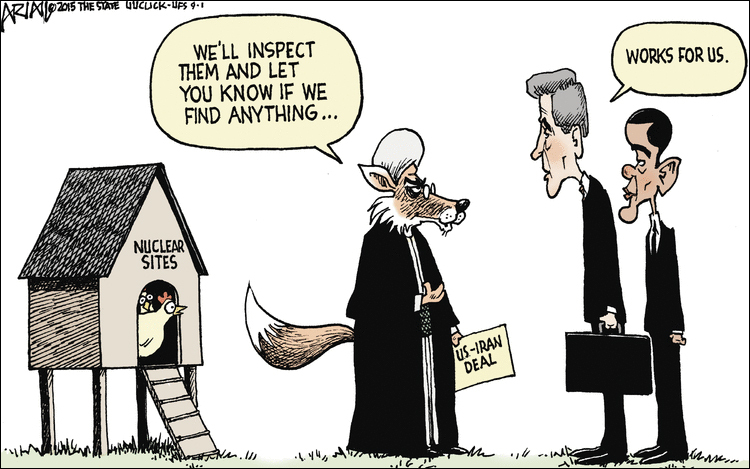 The Iranians are honest about their plans. Our leaders are dishonest when they insist we can safely disregard the rhetoric. We’ve been down this road before, thinking it a joke when Osama bin Laden declared war on us in the 1990s. [On 9/11] the world changed forever, it was often said. Certainly it did for those survivors who gather at the powerful memorial and museum, and for the millions of visitors from around the world who come to bear witness. As it did Friday, the reading of the names and the playing of taps always lets loose the raw emotions of that awful day. Yet the Iran deal says the world didn’t change, and that America, or at least its president and his party, are holding fast to a 9/10 mindset. They are wrong, and the country will surely pay a price for their folly. Published September 13, 2015 at The New York Post. Reprinted here September 17, 2015 for educational purposes only. Ayatollah Khamenei, who repeatedly declares that Israel will be “eliminated,” wrote just before the Senate vote that, “God willing, there will be no Zionist regime in 25 years.” And he made it clear that Iran, which has militias and terror proxies in Lebanon, Syria, Iraq and Yemen, and supports Hamas and Hezbollah, would not be changing its stripes, writing: “During this period, the spirit of fighting, heroism and jihad will keep you worried every moment.” Think of that: We are lifting punitive sanctions not in the aftermath of victory or as part of a comprehensive peace agreement. We, along with other so-called great powers, are unilaterally declaring peace while our adversary repeats its declaration of war against us and Israel. What is your response to this assertion? Do you agree or disagree? Explain your answer.